When? Whenever you would like to withdraw your earnings from LingWorld.com. Why? When you earn money on Lingworld, the student/conversation partner payments get credited to your Lingworld account. 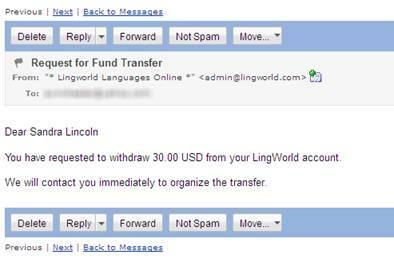 You may like to transfer your LingWorld.com earnings to your own PayPal account or bank account. *Note: Depending on the country you are based, we use Paypal, Credit card Transfer, Telegraphic Transfer, Western Union for fund transfer. For China, we use Western Union and Bank Of China transfer only. Contact us at admin@lingworld.com if you would like more information on available payment modes for your country. 1. Click Withdraw Earnings in the My Account section of the navigation pane. The Ask for a fund transfer screen opens. 2. Type the amount you would like to withdraw in the Enter amount to withdraw field. The minimum amount you can withdraw is $30. 3. Click the Request button. A message displays noting that your request has been received and you will be contacted shortly with information about the request. 4. You will receive an email noting that you will be contacted immediately regarding your withdraw request.